Overlooking the Garden of the Gods and Colorado Springs is the Mountain Shadows neighborhood. Built from 1980 through 2007, the homes here range from the mid 100's to over $600,000. Homes here can have up to 6,000 SF and five bedrooms. 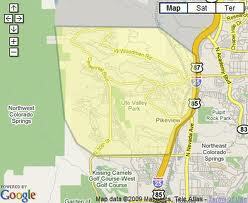 Mountain Shadows is situated between two of the best parks in the city. To the south is Garden of the Gods, a national natural landmark. Miles of trails and paths intertwine through the towering sandstone spires offering hiking, mountain biking, rock climbing, a visitor center and the world famous Garden of the Gods Trading Post. To the northeast is Ute Valley Park, which offers many miles of singletrack trails that are perfect for mountain biking, hiking, nature walks or just taking the dog out for a run. It is a great place to get some fresh air, exercise and meet your friendly neighbors. There is plenty of shopping, dining and entertainment to be had close to the Mountain Shadows neighborhood. Rockrimmon Blvd to the northeast provides easy access to I-25 and the North Academy corridor which offers countless shops and stores including an REI, Lowes Home Improvement Center, and the Whole Foods Market; as well as restaurants such as the Olive Garden, Panera bread and the local favorite Elephant Bar. The Chapel Hills Mall is also located here, offering movie theaters and plenty of dining and shopping. Since there is easy access to I-25 from Mahogany Vale, commuting is a breeze. The Air Force Academy South Gate is about ten minutes away, while the main gate to Fort Carson is about fifteen to twenty minutes to the south. Commuting to Downtown Colorado Springs is less than fifteen minutes away, and Castle Rock and Denver is just an easy drive to the north. Colorado Springs School District 11 serves the Mountain Shadows neighborhood. As the largest district in the city, D11 offers parents and Students the most academic choices in addition to a challenging and innovative curriculum. Students here attend Chipeta Elementary School, Trailblazer Elementary School, Holmes Middle School, and Coronado High School. With its great location, comfortable homes, amazing outdoor recreational opportunities, nearby shopping, dining and entertainment as well as great schools proximity to military bases, Mountain Shadows is a great place to come home.